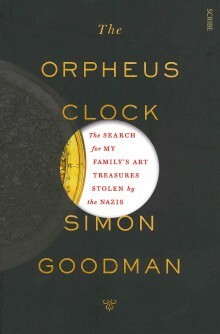 I thought of this as I was reading The Orpheus Clock, an account of Simon Goodman’s search for family art treasures that had been stolen by the Nazis. He begins the book with his discovery of some old boxes hoarded by his father, which came into his possession after his father’s unexpected death. Bernard Goodman, once Bernard Gütmann, was eighty, but it was not his body that life had broken. Later on, as the author explains that the box contained voluminous correspondence and files, he says that his father’s quest for justice was an obsession, and that the few things that were recovered caused division and dissension amongst the remaining family members. It is unutterably sad that in addition to all the horrors of the Holocaust, the quest for justice and recompense has been so complex and tortuous and that it is still not resolved more than 70 years after the end of the war. The first part of the memoir traces the rise of the Gütmann family and their prominence in German banking. They moved in elite circles, and lived a life of luxury. A man of excellent taste, Simon Goodman’s grandfather Fritz built a magnificent art collection which included works by Degas, Renoir, and Botticelli, and a superb collection of silverware. With the rise of the Nazi party, some family members relocated to other parts of Europe, but fatally, others believed that the histrionic hatred of Jews was only another manifestation of the anti-Semitism that had historically ebbed and flowed to coincide with economic downturns and recovery. Fritz and Louisa Gütmann settled in the Netherlands, where they wrongly believed that they would be safe, and their son Bernard went to study in England (where he anglicised his name, and survived the war). The next part of the book covers the ghastly history of the Holocaust, and how it impacted on the extended Gütmann family. But it also includes the not so well-known scheme to systematically loot the occupied territories to build a personal collection for Hitler and for his henchmen. (There are reports this week that a Nazi train full of looted treasure has been found in Poland.) Conquerors have done this kind of looting since time immemorial, of course, but surely none have done it with such extraordinary duplicity, maintaining a fiction of buying the art with now notorious Nazi bureaucratic paperwork, while systematically stripping Jewish owners of their property with bargain-price payments paid into banks that Jews couldn’t access, before shipping the victims off to slave labour and the death camps. But it was this fiction of buying the art that made recovery a legal minefield after the war. A surprising amount of the art was located quite quickly by an American team called the Monument Men, but claimants – often dispersed around the world – had to be able to identify it, and prove ownership. Just the process of identifying it was hard enough: imagine being a descendant with no particular expertise in art and having to name and describe the paintings on your grandparents’ walls, and state their size with accuracy. Paintings are sometimes renamed, and occasionally they are attributed to different painters after an authentication process. But proving ownership when the Nazis had forced the owner to sign sale documents in triplicate at gunpoint was a legal conundrum requiring common sense and a fair go, which Goodman says that the post-war socialist Dutch government wasn’t disposed to offer because they weren’t interested in making things easy for ‘rich capitalists’ to get their pictures back. For Bernard as executor of his parents’ stolen estate, it was a frustrating and mostly fruitless task which added to the devastation caused by the loss of so many members of his family in the Holocaust. What Simon discovered after Bernard’s death was that a lot of the recovered art work flooded the market in the post-war era, and much of it made its way to America because there was post-war austerity everywhere else. While I can understand the discomfiture of an unwitting buyer being suddenly confronted with the knowledge that they have a stolen artwork on their hands, as Goodman tells it, the story of having to fight in the courts to recover his grandfather’s artworks is an unedifying one. Other reviews are at The Daily Mail UK and you can read Simon’s own account of the Rubens in the Courtauld Gallery at the Irish Times. I just watched the Monuments Men and I was thinking this review ran along parallel lines to the movie I was watching. Interesting coincidence! I’ll have to see if I can get it on video. I missed Helen Mirren’s film The Woman in Gold too, I am too slack about getting to the movies!